Interesting personalities, creative minds and colorful life stories are just some of the qualities found in the hoteliers behind members of Design Hotels�. To celebrate their originality Design Hotels� is releasing the new Design Hotels� Made by Originals book containing backstories, surprising anecdotes, and inspiring moments of the driving forces and creative spirits behind the world�s most expressive hotels. The book is in addition to the annual publication The Design Hotels� Book Edition 2011 which showcases 200 member hotels in 120 destinations across the globe. Both can be purchased through www.designhotels.com/shop. �This is the first year we are dedicating an entire book to the people behind our properties. We want to showcase the Design Hotels� community of creative people, including hoteliers, architects, artists and designers, and offer the reader a more personal way to get to know our 200 hotels. The book highlights the imaginative spirit that shapes our brand through a series of in-depth portraits of the Design Hotels� �Originals� - the people who make our member hotels so extraordinary,� says Design Hotels� Founder and CEO Claus Sendlinger. The Design Hotels� Made by Originals book features 33 stories on the original people behind the member hotels, written by international journalists and illustrated by renowned photographers and artists. Originals presented include Shah� Kalaidjian, owner of the chic Hotel Sezz Saint-Tropez, who gives a glimpse into his world of polo, traveling and life on the C�te d�Azur, and reflects on his long friendship with designer Christoph Pillet. Alessandro Catenacci, owner of the newly-opened Nobis Hotel, talks about his passion for family and food, and gives his tips on discovering the real Stockholm. Also featured are the entrepreneurs behind the Germany-based 25hours Hotel Company, a high-glam-budget-minded group of properties that will have two new additions this year in Vienna and Hamburg. The visionary behind Park Hotel Group, Priya Paul, whose newest hotels include The Park Hyderabad and The Park Pod Chennai, shares her life story about how she took over her father�s hotel group at just 23, transforming it from a small collection of properties to a portfolio of modern and experimental boutique hotels. Martin Lee also shares his vision of The Mira Hong Kong, a high-tech luxurious urban retreat partly designed by celebrity lifestyle guru Colin Cowie. The first-ever Oxford American Summit for Ambitious Writers�a five-day, creatively intense workshop for writers seeking to enhance their literary skills�will take place June 21-26, 2011, atop picturesque Petit Jean Mountain in Arkansas. The application process for the Summit begins Jan. 15. The Summit, a collaboration between The Oxford American and Winthrop Rockefeller Institute, will offer participants the opportunity to improve their writing in a peaceful and stimulating environment. "The inspiring mountaintop locale and substantive programming make the Summit ideal for writers who want to grow as artists, and is not simply for people who want to be published as is," said Marc Smirnoff, editor of The Oxford American and one of the lead organizers of the Summit. During the Oxford American Summit for Ambitious Writers, literary professionals will challenge participants to sharpen and deepen their writing skills through daily writing classes, lecture sessions, and manuscript critiques. Distinguished faculty and guest lecturers will teach a number of workshop sessions that focus equally on short fiction and creative nonfiction. Publishing experts will lead innovative programming designed to hone the skills that increase a writer�s chance of being noticed by editors. Confirmed faculty members include Wells Tower (recently named by the New Yorker as among the 20 best fiction writers under 40); Kevin Brockmeier (one of Granta magazine's Best Young American Novelists and winner of the O. Henry Award); Pico Iyer (praised by Time as "among the finest travel writers of his generation"); as well as Heidi Julavits, William Whitworth, Tom Franklin, Cristina Henr�quez, Scott Huler, and Jay Jennings. Detailed biographical information about each faculty member is available online at summit.oxfordamerican.org. Applications for admission to the Oxford American Summit for Ambitious Writers will be accepted through May 1. The admissions committee will notify participants as they are selected, so it is possible that all available student slots will be filled before May 1. Those interested are encouraged to submit application materials as early as possible. Full application instructions and materials are available online at summit.oxfordamerican.org. The tuition for the Summit is $1,000, and the room and board charges (including all meals) are $700 for single occupancy rooms and $550 for double occupancy rooms. Some partial and full scholarships are available, and every applicant will be considered for those scholarships. The Los Angeles Times has already said, "...seem[s] like a pretty fantastic place to spend five days writing." 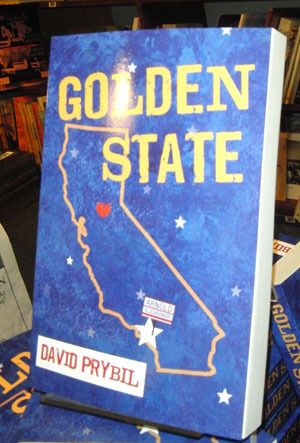 A new book by David Prybil was featured at a book signing in Santa Barbara at the Book Den during the Santa Barbara International Film Festival. David, a full of life character himself, gave interviews to the press and chatted with book buyers over tequilla shots. �Golden State� is the story of four people in Sacramento living their versions of the California dream. �It seems in general that California as a state attracts dreamers, people that are looking for more, whatever that may be. Whether it�s the Gold Rush that helped found Sacramento or coming to Hollywood to be discovered as a star, or Silicon Valley, people are thinking they are going to go out there and create the next Google. �When I was following the recall election, it just seemed like that kind of encapsulated that better than just about anything. It was just so out-of-the-box bizarre. All of a sudden there�s 135 people running for governor. Prybil says his characters feed off this example of the California dream that Schwarzenegger exemplified in winning the recall election, it was an opportunity to write interesting characters. �There are a lot people that spend their entire lives chasing unrealistic dreams, and that can be very tragic at times. What I found with my characters is that the dreams they sought, that they were chasing at the beginning of the story, aren't necessarily the ones that came true, but it led them ultimately to some kind of happiness. It�s like that Rolling Stones song: �You can�t always get what you want, but you get what you need,� Prybil said. On February 22, the highly anticipated debut novel by Patricia Selbert, The House of Six Doors, hit the international market. A native of the Dutch Caribbean island of Curacao, the author has written a novel in English that paints a vivid picture of the mixture of cultures that make up that very unique place. On October 10, 2010, Cura�ao was declared an autonomous nation (previously part of the Netherlands Antilles). 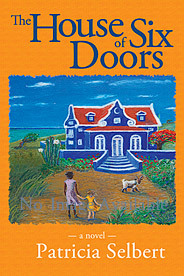 Publishing by the Seas is pleased to partner with The Cura�ao Tourist Board for the launch of The House of Six Doors. �Inspired by what I remembered and driven by what I have learned during the course of my life, I set out to write. The result is my novel, The House of Six Doors. To see it published is, for me, a great source of satisfaction and a cause for celebration,� said Selbert. "I am honored and grateful to have the support of The Cura�ao Tourist Board and the people of Cura�ao. I am touched by the open hearted reception" Visit: www.publishingbytheseas.com. Note: I loved this book. It is such a touching story of the powerful influence women have in the lives of their family and friends. It is a story about the kindness of strangers and the process of growing up, becoming your own person and the struggle to evolve as an independent woman.